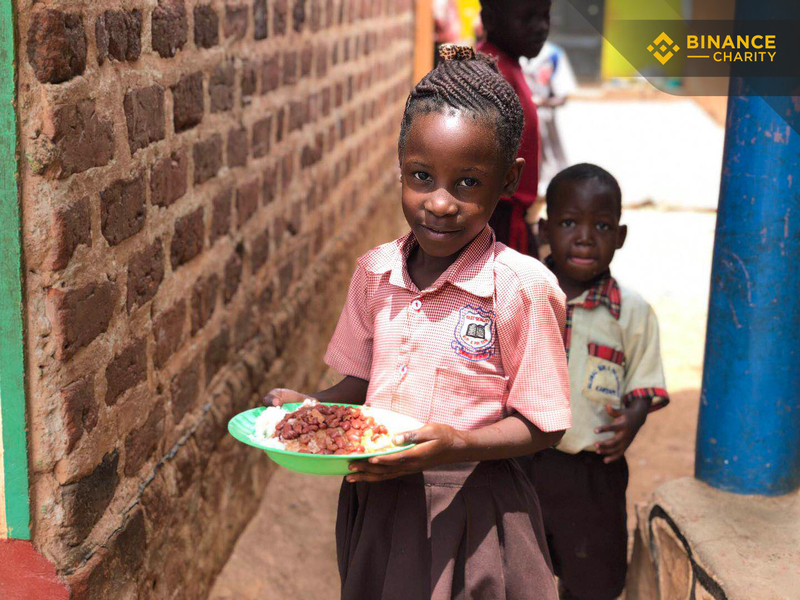 Binance Charity Foundation (BCF), the philanthropic arm of global cryptocurrency exchange Binance and blockchain-enabled charity platform, has announced the expansion of its Lunch for Children program to 10 additional schools in Uganda. Since its initial launch and distribution last February for students and staff of the Jolly Mercy Learning Centre in Kampala, BCF is expanding its support to 3,747 students and staff across 10 schools in Jinja and Kampala in Uganda. Each beneficiary was provided with the mobile crypto wallet, Trust Wallet account where they receive a daily crypto donation worth US$0.30 in BNB for their school lunches for a full year. The donation for these 10 new schools, totaling in US$236,061, was made possible by Binance and BCF’s sponsors, as well as TRON, IOST, and a Binance VIP customer, with the distribution of delivery, separated within 3 tranches for the current timeline. The donated crypto funds will then be delivered to the crypto wallet held by the vetted suppliers, who provide food to the schools every day. The suppliers are then able to redeem crypto to Uganda shillings on Binance Uganda, which was established in October 2018 as the first fiat-to-crypto exchange of Binance. The Lunch for Children campaign has generated significant interest from the entire crypto space on the use of blockchain for charity. So far, more than 10 crypto companies have pledged to donate to BCF, with five of these companies already sending their donations. We thank the companies that joined us in pioneering goodwill and charitable giving on the blockchain, while bringing back more transparency and accountability in charity. The lunch menu changes every day and varies between schools. For instance, on March 27, the children at His Grace Junior Schools ate fried rice, nuts, and silverfish. They were so happy, and some of them said they had their best meal ever that day. Others said they ate twice today, something they never did before. Many locals, who were previously excluded from traditional charity programs, also greatly welcomed this blockchain-powered feeding program. The schools bought some plates for the lunch program and invited some of the locals to join for a meal. School teachers have also been encouraged through the program as the meals will help their students perform at their best without empty stomachs. With food no longer being a concern for the community, the people are empowered to further enhance their lives, whether it be through more plates or better grades. At Binance, we have witnessed the power of goodwill, generosity, and charity in the crypto space from the start. When we initiated the Binance Charity Foundation last July 2018, TRON generously donated US$3 million to BCF, showing their full support for the charity cause. 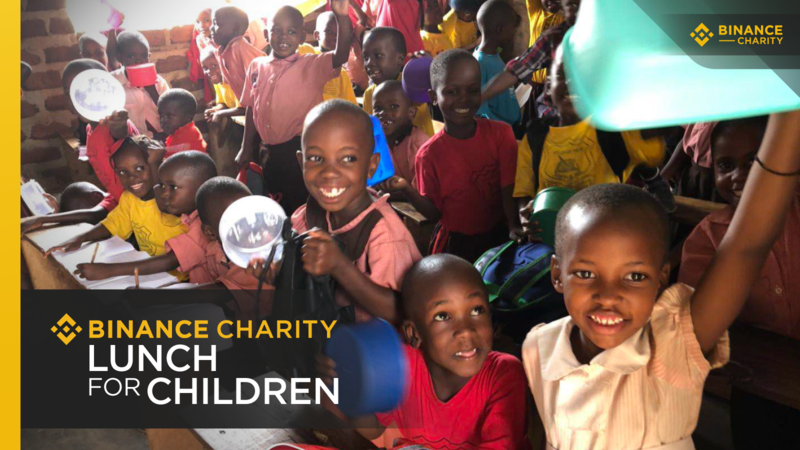 Last January 2019, when Binance Charity announced the Binance Lunch for Children campaign, Zcoin dedicated to supporting the pilot project at Jolly Mercy Learning Centre for a full year. “Blockchain is all about helping make the world a better place, from the financial centers of the world to the underdeveloped regions of the world,” said Justin Sun, founder of TRON and CEO of BitTorrent. “TRON is supporting the lunch program at Best Quality School for a full year, using part of the US$3 million it made last year. “Donating money to give kids a healthy, nutritious lunch is an ideal all in the industry should follow,” Justin added. IOST’s donation will be used to support four schools: Kitegoma C/U Primary School, Nakigo Secondary School, Rayyan Islamic Nursery and Primary School, and Rainward Kindergarten. 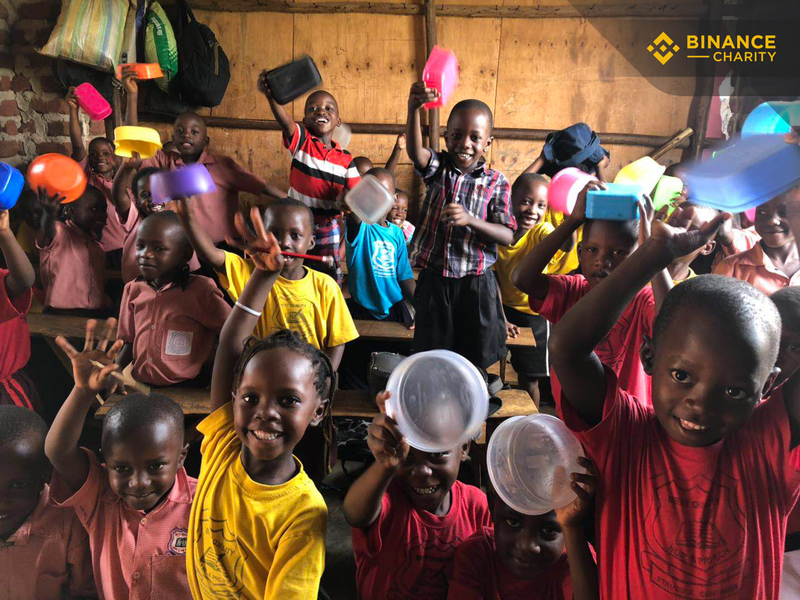 For Binance’s part, the global exchange has pledged to support one year lunch for the Kide Nursery and Primary School, totalling US$33,768, which started on March 25, 2019. The execution of the Lunch for Children project is supported by Lunch for Children Foundation (LFC), a non-profit organization registered in Kenya and created for the purpose of providing solutions to hunger, food security, and poverty by supporting children in building a brighter future. LFC co-founded the Lunch for Children program with Binance Charity. They have a mutual vision of pursuing a transparent and efficient donation model enabled by blockchain technology. The year-long project not only supports food donations but also monitors children’s educational improvement. The project tracks changes in attendance, enrollment, learning performance, and nutrition status across the school beneficiaries of the program, under the guidance of the Ministry of Primary Education of Uganda. Binance Charity Foundation, launched in July 2018, introduced its first fully transparent blockchain-enabled donation platform in October 2018. The platform exhibits a traceable donation flow from the donors all the way to end beneficiaries. 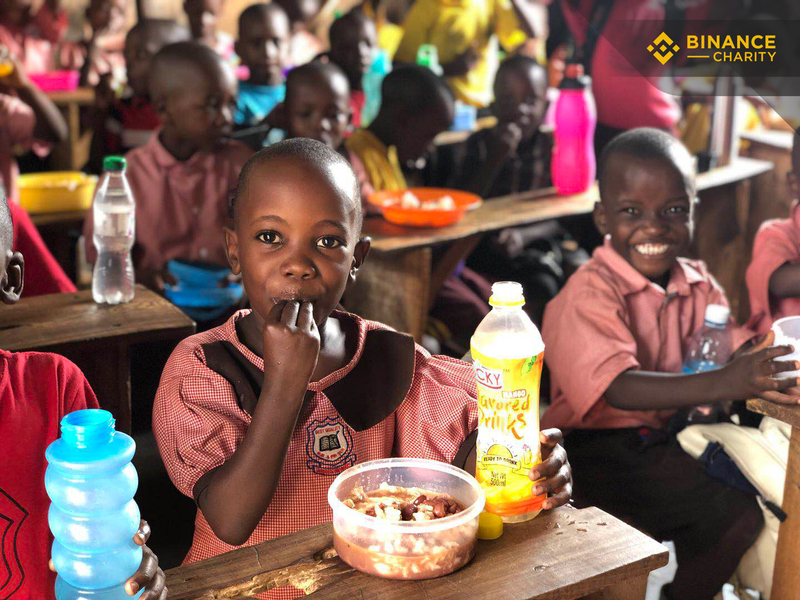 The Binance Lunch for Children initiative was launched in January 2019, aiming to save children from hunger and educational problems that result from malnutrition. To learn more about BCF, donating to a campaign and donation distribution details verified on blockchain, please visit www.binance.charity. Binance Charity Foundation (BCF) is a not-for-profit organization dedicated to the advancement of blockchain-enabled philanthropy towards achieving global sustainable development. Binance Charity aims to transform philanthropy by developing the world’s first decentralized charity foundation to build a future where blockchain technology can be used to end all forms of poverty and inequality, advance sustainable development and ensure that no one is left behind.